It started as a rumor, like so many things in the offseason do, and became fact sometime Tuesday afternoon. 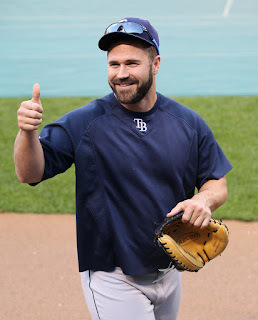 The soon-to-be 33 year old Kelly Shoppach signed a one year deal with the Mariners for a reported $1.5 million deal with an additional $500,000 possible through incentives. It was expected the Mariners would sign another catcher at some point before spring training to back up Jesus Montero during the regular season after signing Ronny Paulino to a minor league deal with an invite to spring training. So what does this mean for the Mariners? It means that Olivo is no longer with the team and has pretty much no chance. So if the Shoppach signing isn't enough to celebrate, remember that Olivo will wind up somewhere else and open a bottle of champagne. Or sparkling cider, if you can't/won't drink. Actually, everybody go with cider. It's less likely to make your liver cry. With Shoppach having played for Eric Wedge in the past while with the Indians, Wedge should have a fairly good idea of what Shoppach's strengths and weaknesses are. He's obviously not going to be the primary catcher, but he could be a valuable backup. He's never been a regular catcher and has done fairly well in the backup role, especially against lefties. For Shoppach's career, he's a .203/.290/.368 hitter in 1117 plate appearances against righties. Against lefties, he's hit .267/.358/.510 in 611 plate appearances. That's about a sample size of one year, so it's not a massive amount of data, but for a platoon split over a career, it works just fine. Most of his starts at catcher are probably going to be coming against lefties, but that's just a guess. There are problems with that since, if Shoppach is behind the plate, either Montero or Morales will be riding the pine for most, if not all, of the game. Wedge has stated that he wants Morales at DH for the majority of his playing time, so if Montero can't DH and Shoppach is behind the plate, who sits? Now that I think of it, that's probably why Jaso was traded. If Jaso had stayed and was more than a backup, the roster construction would be a nightmare practically every night. Depending on who you talk to or what stats you read, Shoppach is either a decent fielding catcher or average bordering on mediocre. I prefer stats, but in conjunction with the opinion of baseball people that no a lot more than I do. With that said, Shoppach is a career .226/.314/.418 hitter and he's more known for his offense than his defense. Take that for what it's worth. Taking a look at some of the stats Baseball Reference have, he's been just above average behind the plate for his career. The Rtot (Total fielding runs above/below average) for Shoppach over his career has been 5. So over his career, he's been worth 5 runs on the defensive side of the ball. Then again, who really knows. One thing I do know is using Excel is fun. All I did was divide the number of innings played as a catcher by the number of passed balls. Basically, it's how many innings on average a catcher plays between passed balls. It's very simplified and I did it only to show that maybe we won't have to stab our eyes out after watching so many passed balls. I guess that depends on Montero, but you get my meaning. So a backup catcher for a primary catcher that isn't very good at catcher. Montero has a ways to go before he's an average catcher, but by then, maybe they'll cut Shoppach and bring up Zunino. Then what are you going to do? You bring up Zunino, you don't want him riding the pine, you want him to play. If he plays, Montero goes to DH, Morales maybe moves to first, Smoak/Morse/Carp/Whoever gets sent down or worse. Now we're back to roster construction and that gave me a migraine last time. So conclusion time! While I still don't completely understand the roster construction, it really doesn't matter at this point. What's done is done. Jack Z signed a competent backup catcher so the Mariners wouldn't attempt a full season with just one catcher. Shoppach isn't flashy, won't hit 20 home runs or steal 50 bases, but he'll get the job done behind the plate while adding almost nothing on offense. He's a typical backup catcher and he got a major league deal for $1.5 million with a possibility of $2 million. I have no strong opinion either way except to nod my head and say, "Yeah, kind of expected that."